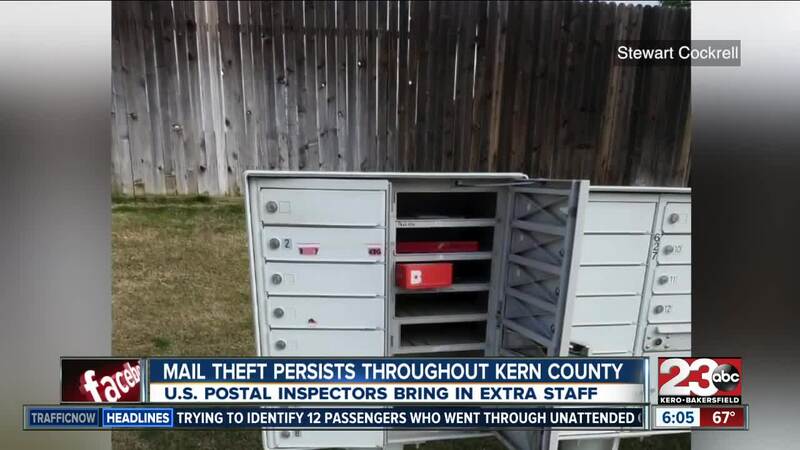 Mail theft is an ongoing problem all throughout Kern County, seemingly becoming worse and worse during the last few months. Kurt Brassfield lives in northwest Bakersfield and, lately, he’s been pretty happy about his mail situation. “Since we’ve got these new boxes we’ve had no more problems with people getting into our mail, at this point,” said Brassfield. Most of his neighborhood was replaced with new, higher security mailboxes within the past month, so he’s much happier than he was a few months ago. We first met Brassfield in November of 2016, just hours after he found his mailbox wide open and his mail gone. “Just criminals, they’re just thieves and they’re stealing from all of us,” Brassfield said during that November interview. Within months, he and hundreds of others throughout Kern County became victims of mail theft. The crime unfolded nearly everyday and cluster mailboxes became and easy target. The frequent thefts moving one of the highest ranking republicans in the nation, Bakersfield Congressman and House Majority Leader, Kevin McCarthy to speak out against it. “It is unacceptable, the privacy that is stolen and the protection that has gone forth,” said McCarthy during an press conference in the summer of 2016. The victims of mail theft started becoming more and more frustrated with the situation. They eventually took matters into their own hands, first creating a Change.org petition. Then, the mounting frustration boiling over as dozens gathered in northwest Bakersfield for a rally, asking the post office to hear their concerns and do something different. U.S. Postal Inspectors along with representatives from the Bakersfield Police Department and the Kern County Sheriff’s Office were in attendance, fielding questions from the discontented crowd. Brassfield himself was also there, hoping to hear changes were in the works. In 23ABC sat down for an exclusive interview with U.S. Postal Inspector, Jeff Fitch to find out what is being done. “We are upgrading security the specifics to that, um, we don’t want to go into, but there are things we are doing and putting in place that are making a difference,” said Fitch. As officials try to upgrade security, they’re also trying to break down who these criminals are and said no two are exactly the same. “Sometimes the individuals work by themselves, sometimes they’re part of a group and the level of sophistication just varies,” said Fitch. Brassfield agreed that there it is probably hard for the U.S. Postal Service to keep up with the ever changing criminal. Fitch, said the problem isn’t unique to Kern County and that mail theft is on the rise all up and down California. However, extra staff has been brought into Kern County from across the U.S. to try to get the problem under control. Still Brassfield hopes eventually more will be done and hopes one day they’ll start delivering door to door again. “This is going to be a continuing problem and it’s going to take the community and the post office getting together and not just giving us a show, but showing us they can do something,” said Brassfield. 23ABC has requested specific numbers regarding the total number of mailbox break-ins that have happened, the number of arrests and convictions and more, but we’re still waiting for those numbers. Officials remind residents to pick up their mail everyday or have a neighbor pick it up or put it on hold at the post office if you'll be out of town. If your mailbox is tampered with or broken into USPS officials said don't call your local branch, instead call 1-877-876-2455. Officials said there are dispatchers available 24 hours a day, 7 days a week, 365 days a year. Those dispatchers will reach out to the local branches. USPS officials said residents should also contact their local law enforcement office just to make them aware of the situation. The Bakersfield Police Department can be reached at 327-7111 and the Kern County Sheriff's Office can be reached at 861-3110. Officials said it's also important to call back to report any unusual activity on your credit or debit cards after your mail is stolen, that helps them better track the thieves.